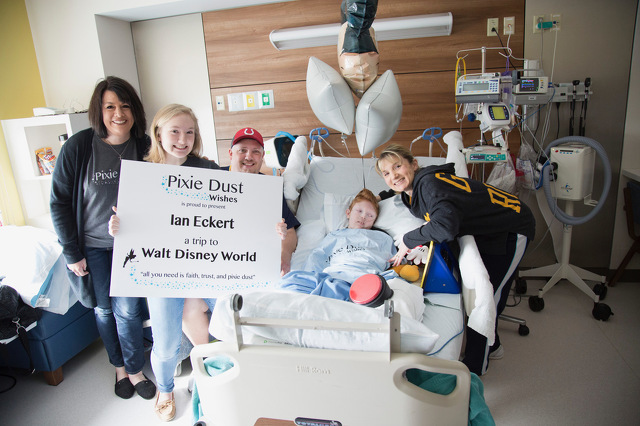 Pixie Dust Wishes founder Jaimie Miller, at left, is pictured with Ian Eckert and his family. The Lake Lynn youngster was the ninth recipient of a Pixie Dust Wish, which provides trips to Walt Disney World for special needs children. STATE COLLEGE — Jaimie Miller, of Pixie Dust Wishes, said the last couple weeks have been very busy for her organization which grants trips to Walt Disney World for children with disabilities and special needs. On Saturday, April 6, Pixie Dust Wishes granted a wish to the Stenger twins — Brady and Jacob, from Chambersburg. Both Brady and Jacob have autism and Jacob has some additional challenges. As usually happens when the non-profit group grants a wish, the boys were very excited to see the balloons and signs waiting outside of the house for them. These wishes mark the ninth, tenth and eleventh wishes that Pixie Dust Wishes has granted, according to Miller. The Third Annual Race to Neverland will occur on Aug. 10 at Tudek Park, 400 Herman Drive, State College. The race benefits the Pixie Dust Wishes Foundation, which was started by Miller. Supporters can also give to Pixie Dust Wishes online during Centre Gives on May 7-8. During the 36-hour event, those participating can make sure that more children with disabilities will see their Pixie Dust Wishes come true.